Publicly announced greenhouse gas (GHG) mitigation targets and emissions pricing strategies by individual governments may suffer from inherent commitment problems. When emission prices are perceived as short-lived, socially cost-effective upfront investment in climate technologies may be hampered. This paper compares the social abatement cost of a uniform GHG pricing system with two policy options for overcoming such regulatory uncertainty: One combines the emissions pricing with a state guarantee scheme whereby the regulatory risk is borne by the government and one combines the system with subsidies for upfront climate technology investments. A technology-rich computable general equilibrium model is applied that accounts for abatement both within and beyond existing technologies. Our findings suggest a tripling of abatement costs if domestic climate policies fail to stimulate investment in new technological solutions. Since the cost of funding investment subsidies is found to be small, the subsidy scheme performs almost as well as the guarantee scheme. 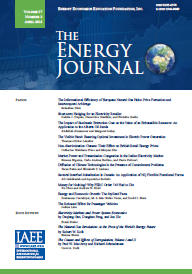 Published in Volume 37, Number 2 of The Quarterly Journal of the IAEE's Energy Economics Education Foundation.